2. Ironical nickname for members of the pro-Kremlin youth organisation наши. Sometimes called нашист. I saw on Tverskaya street client for the Anashists that had parked much as they liked. And on Pushkin square I saw the Anashists themselves, handing out stickers. бандеровцы, бандерлоги m pl [banderovcy, banderlogy] (полит. ): Ukrainian nationalists with a strong aversion of Russian rule, usually from Western Ukraine. Named after Stepan Bandera (1909-1959), founder of the Ukrainian insurgent army (UPA) and the Organisation of Ukrainian Nationalists (OUN), symbol of Ukrainian independantism. Having collaborated with the Germans during WWII he is seen by Russian media as a synonym for fascism. The name is sometimes misspelt бендеры, бендеровцы and is used in the surreal compound жидобандеровцы (implying the supposed Ukrainian fascists cooperate with Jewish forces). ватник m [vatnik] (полит. ): Russian patriot and nationalist, outspoken follower of Putin, who aims to compensate his meaningless life by glorifying the motherland. This insulting term derives from the name of a iconic soviet padded uniform jacket issued during WWII. гебня f [gebnja] (полит. ): Russian secret services, pejorative name derived from the last letters of the acronym КГБ. Often used with the adjective кровавая гебня, variants are гэбня, гэбуха, гэбьё. It can be used to describe the machinery of power of the KGB colonel Putin. гейропа f [gejropa] (полит. ): Europe, insulting blend of гей and Европа used to mock a gay friendly or even gay controlled, decandent Europe. Даунбасс m [downbass] (полит. ): Disparaging nickname of the separatist Donbass region, usually used by pro-Ukrainian activists. Combination of Донбасс and даун (person with Down-syndrom). дерьмократ m [der’mokrat] (полит. ): Rotten politician, a cross of демократ and дерьмо. They robbed the country clean, rascals! What have they done out of Russia, those damned so-called democrats!.. All that because there is no order!.. колорадская лента f [koloradskaja lenta] (полит. ): Saint-George ribbon (or the similar soviet guard ribbon) used as a rallying sign by pro-Russian forces in the Ukraine conflict. The black and orange stripes of the ribbon are likened to the elytron of the Colorado potato beetle (Leptinotarsa decemlineata, in Russian колорадский жук). колорады m pl [kolorady] (полит. ): Pro-Russian activist wearing the distinctive Saint-George ribbon (or the similar soviet guard ribbon) as a rallying sign. The black and orange stripes of the ribbon are likened to the elytron of the Colorado potato beetle (Leptinotarsa decemlineata, in Russian колорадский жук). крыснашист m [krymnašist] (полит. ): Partisan of the Russian annexion of Crimea in 2014. Derived from the much repeated chorus celebrating said annexion: Крым наш (Crimea is ours). Луганда f [luganda] (полит. ): Ironical name of the rebel-controlled Lugansk region, likened to the supposedly underdevelopped African state of Uganda. майдаун m pl [majdaun] (полит. ): Supporter of the Maidan protest (Kiev) and of the pro-western governement. 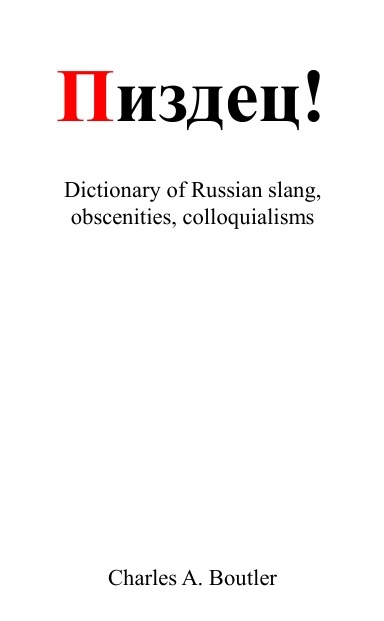 Insult combining Майдан and даун (person with Down-syndrom), commonly used by opponents to the changes. путинг m [puting] (полит. ): Meeting organised in support of Vladimir Putin. Ironical name given by opponents. In the same way the word пехтинг was created (meaning more or less shaming), based upon the surname of a state duma deputy heading the ethics comittee forced to step down after news of his undeclared Florida real estate was leaked in early 2013.
путлер m [putler] (полит. ): Insulting deformation of Putin’s last name, alluding to Hitler. скоммуниздить v pf [skommunizdit’] (полит. ): To nick, steal, embezzle. As communism meant everything belongs to the people, the people took what officially was theirs. совок m [sovok] (полит. ): 1. Citizen of the Soviet Union; 2. The Soviet Union. съединоросить v pf [s”edinorosit’] (полит. ): To steal, especially public funds. Modern form of скоммуниздить. титушки m pl [tituški] (полит. ): Agent provocateur, Ukrainian word (“тітушки”) stemming from the surname Титушко. An individual by that name had been convinced of assaulting Ukrainian opposition journalists in May 2013. The name now describes all the thugs hired by the Yanukovich government to do the dirty jobs.